Joggers are without a doubt one of the IT-pieces this season. The are not only super comfortable, they are stylish as well. What's better than feeling 100% comfortable while looking fashionable?! Right, nothing! 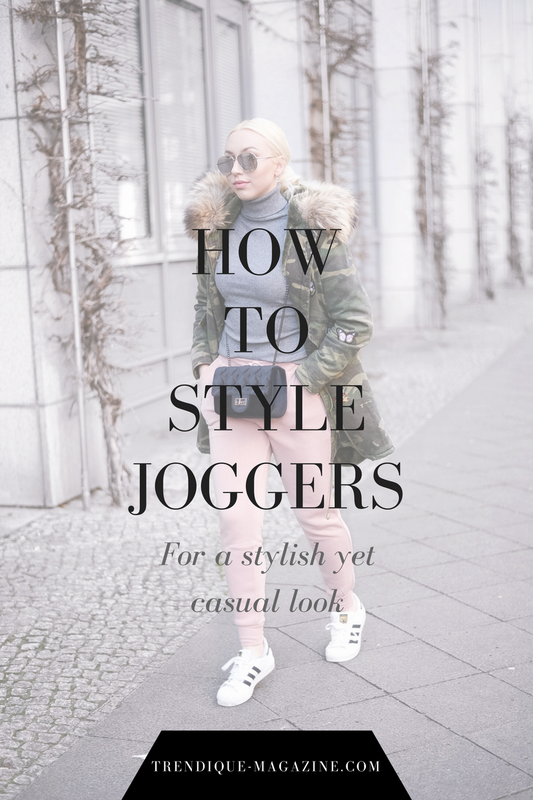 Continue reading to find out my favorite ways to wear joggers. Let's be honest: There's seriously nothing better than feeling completely comfortable yet super stylish. Wearing amazing heels is great- yes, but sneakers and joggers are way better for a daily bases. Good news: You can actually dress up a simple pair of joggers with some heels as well! Every woman has her own unique body shape which is why there are plenty different styles of joggers out there. If you've never tried the jogger trend before, try on a few different styles and see what suits you best. There's no better way of seeking inspiration than on social media. Especially on Pinterest under matching hashtags you can find loads and loads of jogger streetstyle inspiration. You'll definitely going to find something that matches your personal style. This is probably the most important thing. Fashion is a game which has no rules! Don't be afraid to try and wear something you've never seen before. Maybe you're setting a new trend?! You never know! Be brave! Yes, cotton joggers are always great but why not try something different... Suede joggers, leather joggers or super fancy velvet joggers. You'll be the star on the streets! Especially if you have a statement pair of joggers, you should stick to the good old: Less is more. Let the joggers do all the work and keep it simple! Combine a plain black turtleneck and some sneakers and you're good to go. You look beautiful in This outfit ! You wear the jog vert well ! This outfit is amazing I love the color of your joggers! I love it! You styled it well! I just looove how you styled those pink joggers babe ! It’s a gorgeous look!Love the joggers! Well joggers are another fashion trend. There is nothing bad with it as with the other wholesale women pants . The pants for womans are out of the question and there is no problems to find a good pair pants for woman. Awesome outfit! Look so pretty in this lovely outfit. Can you tell me where i find latest trendy clothes and accessories through DL1961 Coupons ? I am very crazy about fashion and always find new variety of fashion.I also purchased some fashionable dresses from DL1961 and save lots of money while using coupons and promo codes. i really glad to share your post. I like this post and keep sharing this kind of information with us.